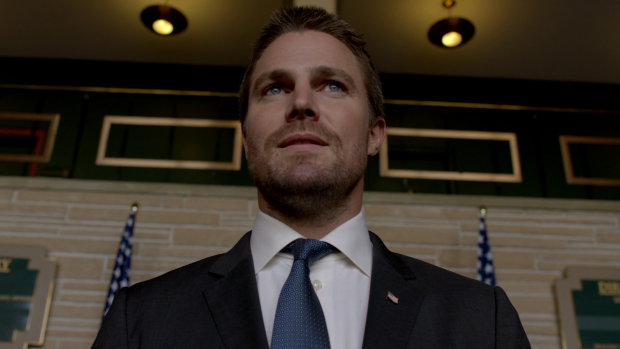 Arrow deals with identity as a concept following Oliver being potentially outed as the Green Arrow last week. This episode deals with identity in a very literal sense -with the investigation into Oliver Queen- but also in a broader sense. I’ll cover the literal first because it’s the most simplistic. Arrow has done this story twice before; once in season 1 and once in season 3. When a costumed hero hides their identity from the public there will always be stories where they are at risk of exposure so it’s pretty standard comic book stuff. Bruce Wayne is not Batman! Wait, what were we talking about? Oliver takes it in his stride and gets straight to denying it. He uses the argument that it wouldn’t be possible for him to act as both Mayor and Green Arrow even though that’s exactly what he’s doing. He’s basically hoping that the truth is stranger than fiction and there’s enough doubt for there to be some debate on the issue. I applaud the show for making reference to the season 1 episode though only one instance is specifically mentioned which ignores the season 3 episode for some reason. It’s not a big deal but it’s curious that it seems to be forgotten about. Oliver sees the power of plausible deniability as his way out of this problem. and there’s nothing definitive to prove that he’s the Green Arrow so it lets him go about his business until more proof either way can be found. I mentioned last week and on the recent podcast that there was potential to create a public opinion subplot on the back of this but unfortunately that doesn’t happen. A benefactor says that his donation will be tripled if Oliver is actually the Green Arrow but other than that and being followed around by press who ask the same annoying questions the episode does very little to play around with this idea. The suspicion brings another complication in the form of FBI Agent Samanda Watson (Sydelle Noel) who is tasked with investigating Oliver Queen and the Green Arrow. Her character is a means to an end in this episode. She mostly represents the constant scrutiny that Oliver is under. She talks about interviewing everyone close to him and it leads to an entertaining scene containing Quentin and Rene but it’s not a story that the episode prioritises. Possibly having his identity exposed makes Oliver take stock of his life and his current responsibilities. Always on his mind is William who isn’t adjusting to living with him very well. After losing his mother his biggest fear is that Oliver won’t come home to him one night. All it takes is a supervillain who is too much to handle, a criminal who fires a lucky shot or even a costly mistake made by Oliver in the field. Being human he’s prone to this no matter how skilled he is. 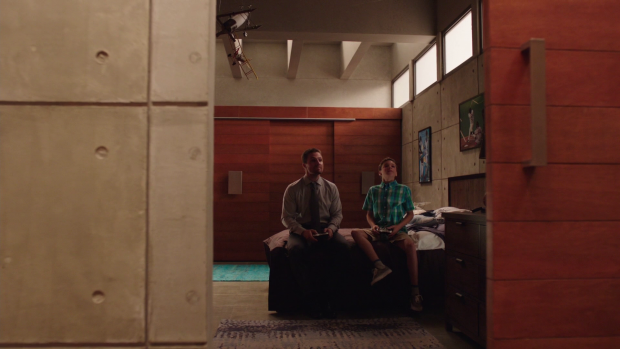 William is terrified of being alone and knowing that his father is the Green Arrow prevents him from settling into his new life as he feels that it’s temporary. It’s an interesting angle that is often seen in these sorts of stories though it’s more common to have a worried significant other protesting the life of a costumed hero. Having the concern come from a child vastly increases the impact of this as Oliver would be leaving someone behind who needs his care and protection more than anyone else does. 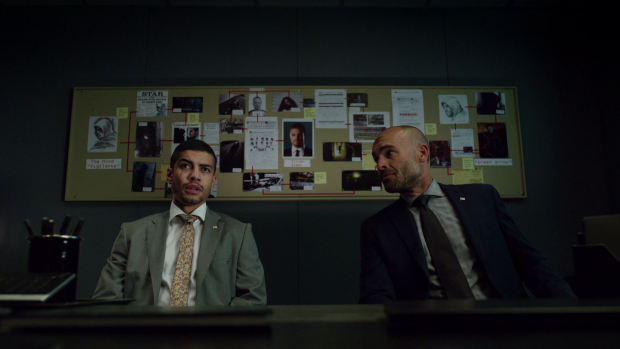 I really liked the interaction between William and Oliver this episode. There’s an unease to their relationship that is beginning to settle down to some degree but still has a long way to go. Oliver’s advice about how best to beat up bullies was excellently done as it adds a personal touch to their relationship that fits perfectly with the Oliver Queen character. It also subverts the usual trope of fatherly advice going the route of “fighting is wrong”. Oliver still doesn’t want William fighting if he can help it but is certainly not going to leave him ill equipped if it comes down to that. 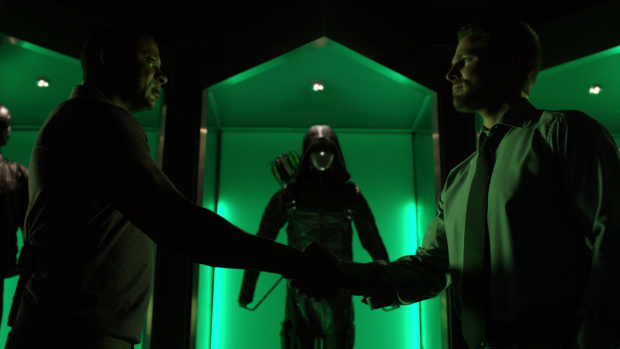 William’s concerns causes Oliver to offer Diggle the mantle of Green Arrow. He’s at a point in his life where being Mayor and a father are higher priorities so he has grown to the point where he no longer needs the Green Arrow identity. Handing it over to Diggle makes sense as there is no one he trusts more to protect the city in his stead. With Diggle wearing the hood he will feel no guilt over his decision as it doesn’t feel like abandoning the responsibility he forced upon himself. It could be that Oliver’s arc this season has something to do with reducing the self imposed weight he carries on his shoulders. On the surface Diggle taking on the mantle might seem problematic for a variety of reasons. Firstly and most importantly is the fact that he also has a child so Oliver asking him to be the main target on the team rather than backing him up seems like an unfair thing to do. I would personally disagree with that as if the situation is analysed from a parental responsibility point of view then John Diggle Jr still has both parents where William only has one left. If Diggle or Lyla are killed then there is still another parent left whereas is Oliver is killed then William is left alone. This could be seen as a selfish way of looking at things and maybe it is but for Oliver and Diggle doing what they do is no longer a choice, it’s a mission that they have both chosen to take on and it has to be seen through until the bitter end. Anatoly is back and that’s…good? The easiest way to look at it is the life of a soldier. Many soldiers go away and serve for years without seeing their families. They miss the birth of their children as well as huge milestones in their lives but do this out of a sense of duty. They believe in what they are doing so make that sacrifice. Whether that sacrifice is justified or not or whether every soldier feels that way can be debated endlessly but for the sake of argument that is the reasoning behind that. Diggle can’t turn his back on the mission because of a sense of duty and the belief that what he does needs to be done. Putting himself in the cross hairs of every villain looking to make an example of Star City’s protector is simply the next stage of that and stepping up as leader of the team is a promotion for him. Another counter argument to this is that Oliver is content with leaving the life of the Green Arrow behind. He’s not doing that because he necessarily wants to; it’s something he does because his responsibilities have changed and it’s not fair for William to live in fear of being left alone because Oliver feels obligated to wear a costume that anyone could wear. Oliver isn’t abandoning his mission here as it merely takes on another form entirely. He is still working to save the city as Mayor which we have seen get a lot of good work done. It’s a job he has embraced and the influence of the position allows him to solve problems he never could as the Green Arrow. Devoting himself fully to that could accomplish even more and he still has the benefit of the Green Arrow at his disposal under the guise of someone he trusts. I find myself really excited about this prospect. Could Arrow be a show that’s brave enough to keep Stephen Amell in the lead position but have the Green Arrow identity filled by another character in the show? Imagine the possibilities if it did and how unique this would make it as a comic book costumed hero show. I don’t think for a second that this will stick any longer than 3 or 4 episodes -if that many- because the show has a habit of returning to its baseline of Oliver Queen working to save the city as a vigilante hero in a Green Hood. Plus the crossover is coming up and he will undoubtedly be in costume for that. Still it’s a nice thought to play around with and I hope the show makes the most of it. Diggle’s lingering issues will probably the thing that derails his career as the Green Arrow. I’m really confused by the approach taken by the writers on this one. He admits to Dinah that it’s degenerative nerve damage caused by shrapnel and nothing more though the show treats his wobbly aim as if it’s psychological which I’ve already said doesn’t work when you consider everything Diggle has been through. It seems likely that whatever he’s going through will cause significant problems for him as the Green Arrow and he’ll be forced to confess the truth to Oliver before giving up the mantle. His scenes with Dinah continue to impress and follow and obvious yet effective through line. She challenges him his inability to be defended on in the field and this pays off later when she almost dies. It’s exactly what you would expect but it’s completely sold by the actors. David Ramsey plays the guilt and denial associated with it perfectly while Juliana Harkavy is an imposing opponent for him on this issue. They have a great bond and it’s great to see the writers making such great use of it. Curtis and Felicity have a subplot that finally addresses something that has been bugging me for a while. They have a discussion on what the team actually do for money. Oliver has money because he’s Mayor, Diggle has money because his wife is Director of A.R.G.U.S., Dinah, Rene and Quentin all work with Oliver in various capacities as well which leaves Felicity and Curtis. Felicity is still living off her severance package from Palmertech which apparently won’t last forever and Curtis has been doing freelance coding in his limited spare time. It answers the question which might seem innocuous by itself though it opens up a subplot for these characters that could actually be an interesting one. They agree to go into business together and change the world that way which could be something unique and interesting featuring these two characters. Their bounce off each other very well and it makes a lot of sense for them as characters. The return of Anatoly as something of a villain of the week is a bit of a mixed bag though it’s a lot better than having a dull one shot villain. Anatoly is a good choice as he represents a piece of Oliver’s past without using flashbacks. He is able to use what he knows about Oliver against him in terms of knocking him off guard but stops just short of ruining him entirely. He’s the most obvious choice for leaking the photograph but it turns out he had nothing to do with it backing up his claims that he’s an honourable man with his own code that he follows. What doesn’t work about the story are his motivations. Coming to Star City to steal money is a bit weak as motivations go and only really works as an excuse for him to appear and disappear in the space of a single episode. Lastly I’ll leave off with my thoughts on the Bruce Wayne name drop. I know a lot of people are excited about it but I can’t count myself among them unfortunately. Don’t get me wrong, I love a fan service reference as much as the next guy but I prefer them to make sense and for me this one didn’t. 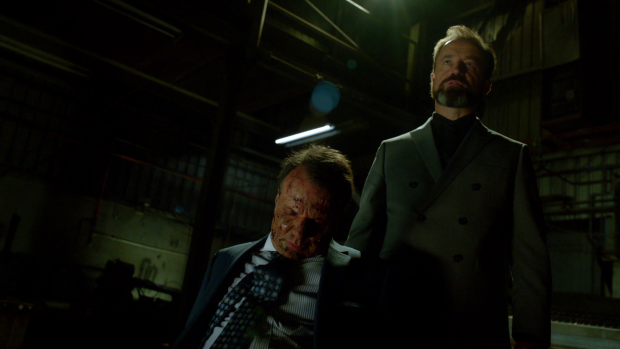 Why did Oliver use Bruce Wayne as an example of someone’s head that could be put on the Green Arrow’s body? Is he that well known? It would work if he was Mayor of Gotham in this universe but if he is then it isn’t mentioned. In this context he might as well have said Justin Timberlake or any other celebrity to point out how ludicrous the notion was. I also doubt that Batman will be introduced in the Arrowverse any time soon though I’m happy to be proven wrong. An excellent episode that could be remembered as the tipping point that changes Arrow as a show. Oliver giving up the mantle as Green Arrow and passing it to Diggle is a really fascinating idea that has a lot of potential. It works for Oliver because he’s passing it onto someone he trusts which means he isn’t abandoning his responsibility as his role in saving the city will be more focused on what he can do as Mayor. It also means that he’s changing to adjust to having William in his life. For Diggle it ties into his sense of duty and how committed he is to the mission though I fear this will be derailed by his injury/PTSD which is poorly plotted so far yet exceptionally acted. The subplot involving Felicity and Curtis deciding to go into business together works really well as it provides and opportunity for these characters to bounce off one another in a plot that works for them specifically. Anatoly as a one episode villain was a mixed bag though worked as a representation of Oliver’s past even if his motivations were somewhat flimsy.